Mix together the soy dressing together in a small bowl. Set aside. Cook the noodles according to the package and drain well. Toss with the soy dressing, to taste. 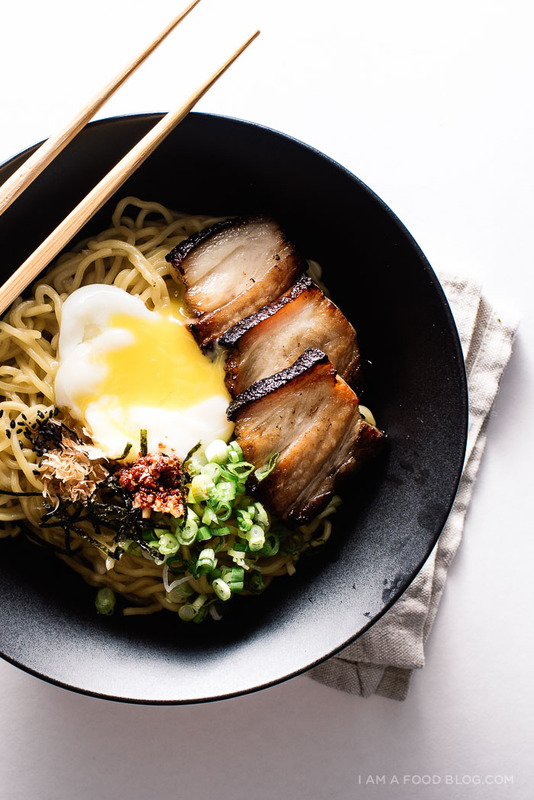 Place the noodles in a shallow bowl and top with pork belly and a poached egg. 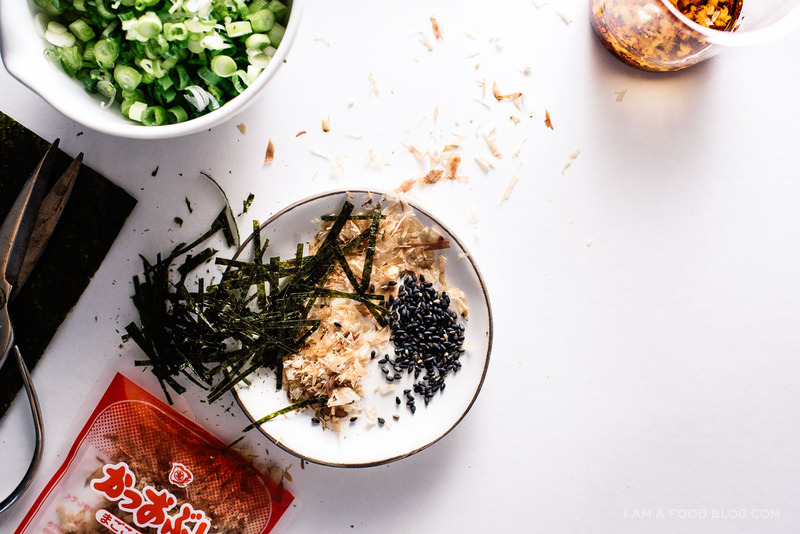 Garnish with seaweed strips, green onions, katsuobushi, and toasted black sesame seeds. Serve with a generous amount of chili oil. Mix and enjoy! Notes: A lot of this can be made beforehand and held in the fridge – if you’re prepared, this brunch comes together faster than you’d think. Make the chili oil and dressing the day before and hold in the fridge. 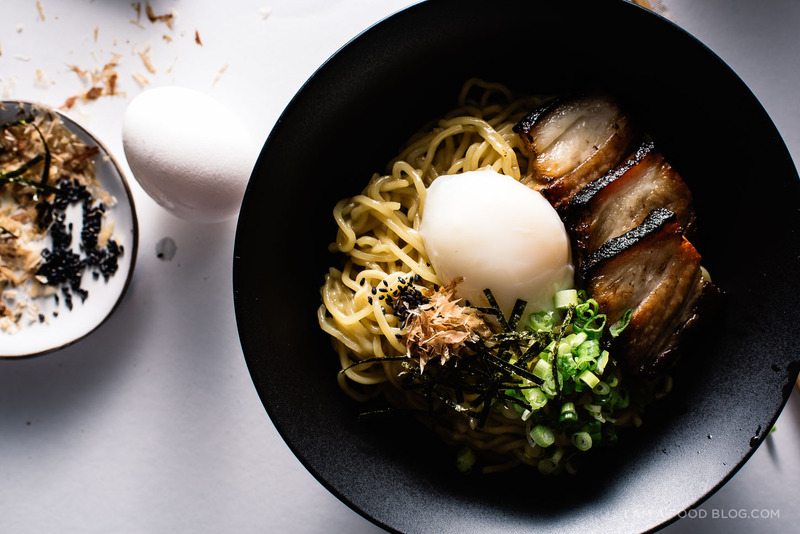 The soft poached eggs can also be made the day before and heated up in a bowl of piping hot tap water while you’re cooking the noodles. 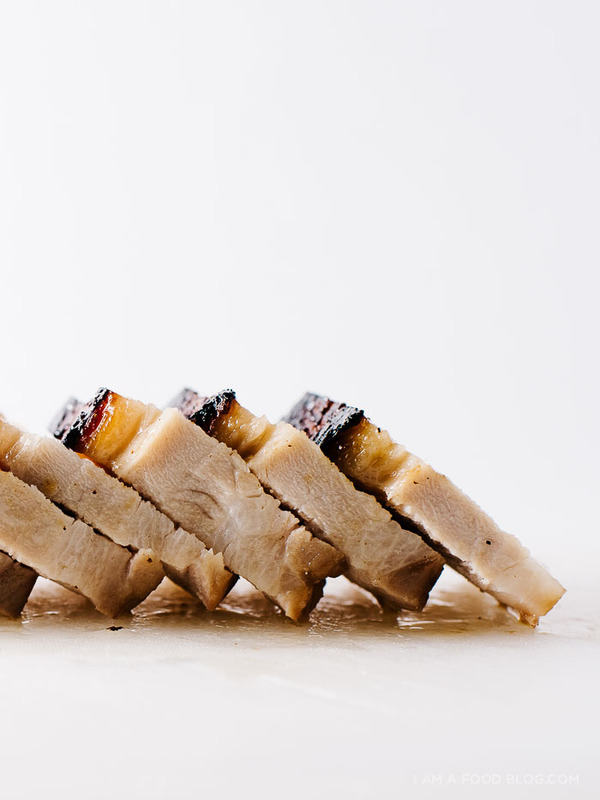 The pork belly can be prepared the day before as well – sous vide it the day before, hold it in the fridge overnight, then slice it and sear it just before serving. **If you haven’t heard of dashi granules/powder, it’s basically instant soup stock. You can find it in Asian grocery stores in the Japanese section. 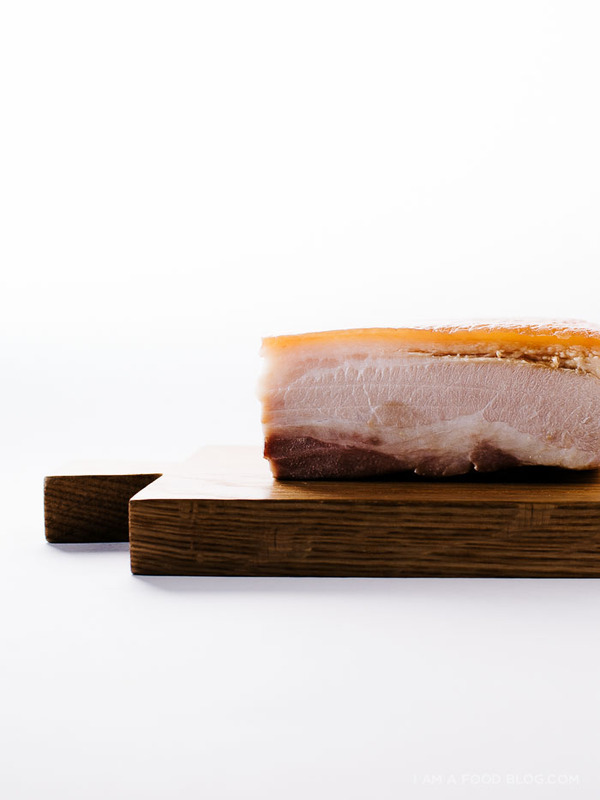 Katsuobushi is dried smoked bonito flakes – they add a punch of umami. 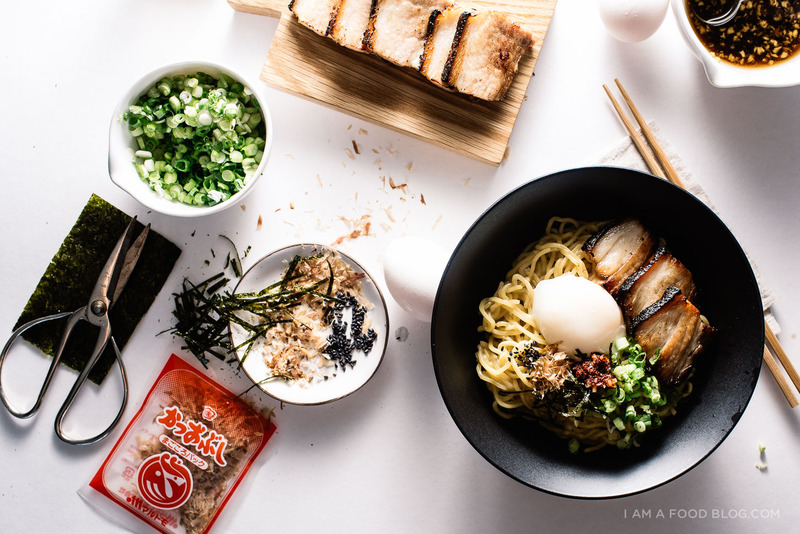 You usually see it on okonomiyaki, takoyaki, and yakiudon. It’s not totally necessary in the recipe, but it is a nice bonus. Mix together the soy sauce, mirin and sugar until sugar is dissolved. Add the mix to a vacuum bag with the pork belly. Fill a large heat-proof container with water and set your sous vide machine to 160°F. Sous vide for minimum 6 hours. Chill, in the bag, overnight for ease of handling. The next day, remove the pork from the bag. Gently wipe off any excess moisture. Sear the top of the pork in a non-stick pan over low heat until deeply browned – you probably won’t need any oil, but if you want to speed up the process feel free to add a touch of oil. Remove from heat and cut into 1/4 in slices. Sear the slices the non-stick pan until golden, 2-3 minutes per side. i’ve heard about free eggs on the table in korea (though these ones are raw for you to crack into your soondubu jjigae, the tofu soup that looks more like a firey volcano). if they had that here (in the us), i’d be just like that guy, stuffing my face with perfectly cooked softboiled eggs, hahahah. Noice one. Droppin a sous vide receipe is pretty intense, but cheers to gettin it out there. Fantastic !! I’m such a ramen fan !!!!! OMG! I absolutely love your blog. It has seriously helped with “that time of the month” food cravings and quick and easy munchies! Thank you! AHH heart eyes emojis everywhere!!!! Totally, totally amazing. This looks so delicious! I am definitely going to try to make this recipe this weekend. 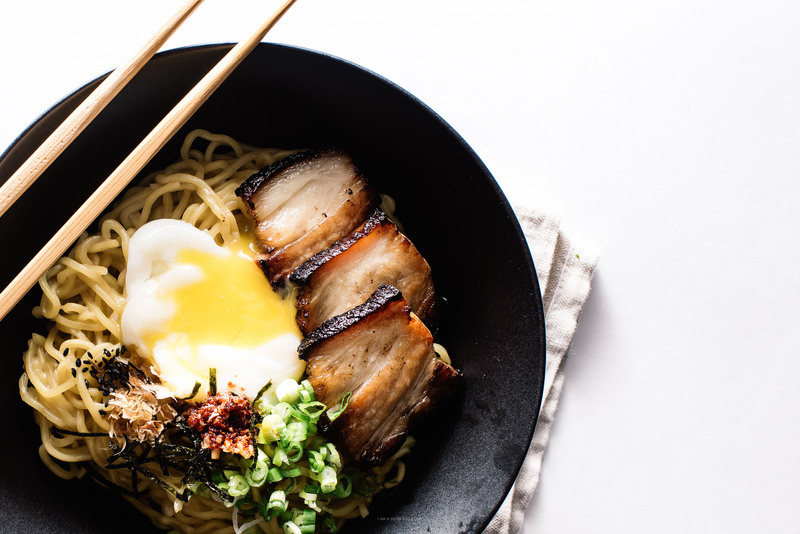 I really want to make this, but I don’t have a sous vide machine. 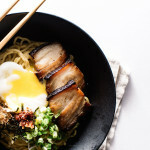 Is it possible to do this by putting the pork belly in a water tight container, submerging it in water, and putting it in a very low oven for many hours? Would this work? If so, got any advice/specifics that would help me out? Thanks! you can just sub in cripsy bacon or maybe this roast pork. hope that helps!